It’s Motivational Monday again! Mondays come so quickly! I am trying to write this with a spoiled Jack Russell Terrier on my lap. We went for an hour run this morning so she is tired! Today I want you to think about Living in Full Bloom-living out to your potential. Finding what makes you Happy! Doing what you are meant to do! Again I want to ask you, what is your passion? What do you like to do in your free time? I believe each and every one of us have special talents and creativity inside waiting to burst out! (That is one meaning of the Happy First egg) I think sometimes we repress it because we either don’t think we have time or are afraid to take the plunge! I think we are happiest when we are creating and doing something we love to do! Make yourself take the time to do something for you. It will make you happier in other areas of your life. Take some time by yourself to just be still and reflect on what you would love to do. Your passion might be something that you just do for fun or it may become a career for you. I guess I relate so much to Gretchen because she was an accomplished lawyer but didn’t love it so she decided to pursue her love of writing. I was a CPA that didn’t love it so I dove into my love of fashion and encouraging others. The time just flies for me when I am working on Happy First. I get lost in it! I love it! Pictured are two of my favorite tees- the “Live in Full Bloom” tees. 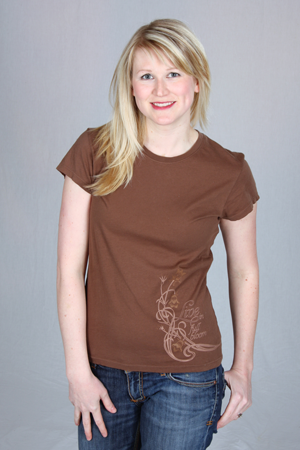 They are perfect for this time of year- one is a chocolate cap sleeve tee. 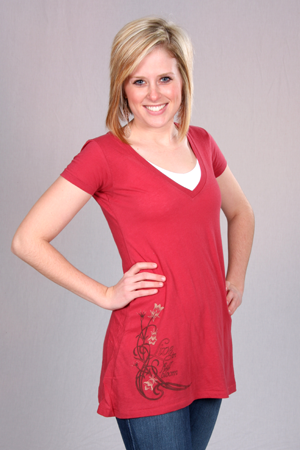 The other is a v-neck A-line organic tunic (great with jeans or leggings) in a red chili color. I want each and every one of you to Live in Full Bloom! Be the wonderful You that You were created to be! You are unique and have talents no one else has! What is YOUR passion, something that you would like to do or already do?